The mural, "Dream Garden," as seen on Monday, July 11, 2016. Last week, the city Department of Licenses and Inspections shut down construction work at the Curtis Center, at 6th and Walnut streets on Washington Square, in order to protect the priceless mural from damage. Citing concerns that ongoing renovations at the Curtis Center in Center City could cause damage to a priceless mural, the city's Department of Licenses and Inspections halted work there on Friday. 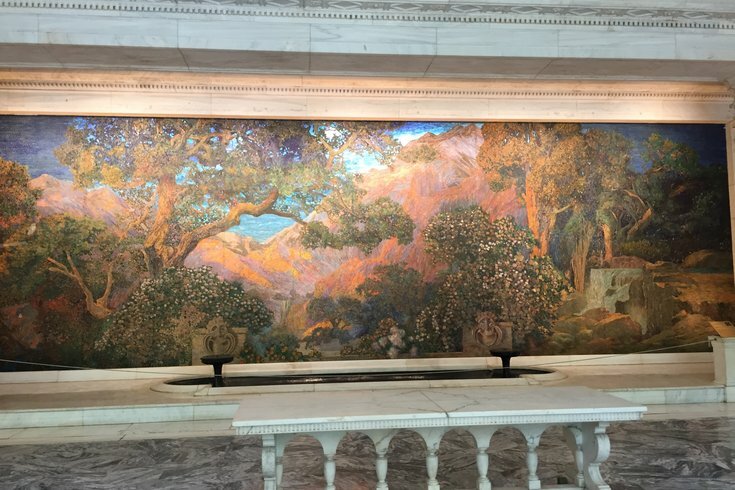 Work last week on a stairwell in the building caused vibrations in excess of an agreed-upon level, raising the potential for possible damage to "Dream Garden," a 15-by-49-foot mural by American artist Maxfield Parrish, according to Karen Guss, an L&I spokeswoman. The work of art is considered priceless. The Curtis Center at 6th and Walnut streets is undergoing a $25 million renovation project to be completed in next spring of next year. Work on the renovation project, Guss said, was halted Friday after the "vibration velocity" caused by the construction went over a tenth-of-an-inch-per-second threshold. Before construction started, Guss said, the four-ton mural's owner, the Pennsylvania Academy of Fine Arts, warned that vibrations caused by the construction needed to be kept below that level to protect the artwork from damage. "We went down and shut down the work," said Guss on Monday. "They are going to have to address it before starting work again." Guss said that on at least three occasions, equipment set up by PAFA to measure vibrations found they exceeded that threshold. After informing the Philadelphia Historical Commission, PAFA contacted L&I on Thursday, which led to the shutdown, she said. 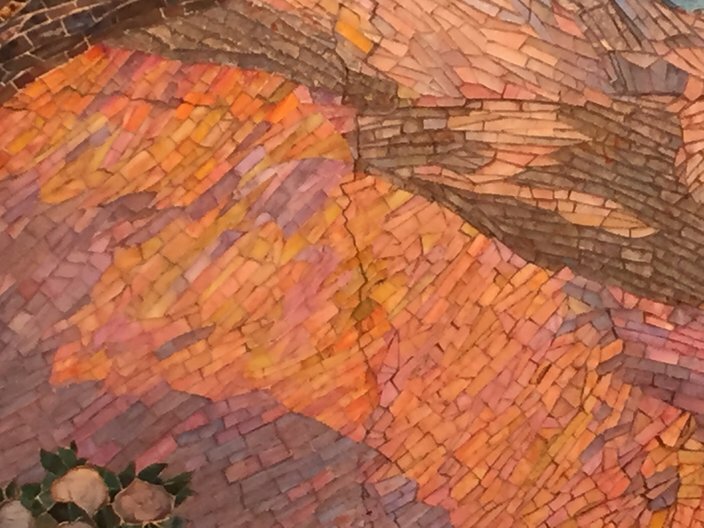 Cracks like this one can be seen in the four-ton, priceless mural Dream Garden, at the Curtis Center. But, they are pre-existing and were not caused by recent construction at the building, an L&I spokesperson said. On Monday afternoon, Shlomo Morgulis, a spokesperson for Keystone Property Group, which owns the Curtis Center, shared a prepared statement on the work stoppage. "As committed stewards of history and active investors in The Curtis and surrounding Independence Mall properties, we have taken great care to preserve the beauty and history of the local architecture, as well as the Dream Garden mural. We will continue to take every necessary precaution to ensure that all of the unique and historic features of our buildings are fully maintained." "Dream Garden" is made of hundreds of thousands of pieces of hand-blown favrile glass tiles in 260 colors, created specially for the mural under the supervision of Louis Comfort Tiffany. Completed in 1916, it took 30 artisans about six months to install the detailed mural in the lobby of the Curtis Publishing Building on Washington Square – home of the popular The Ladies' Home Journal and The Saturday Evening Post magazines. The work was commissioned by Edward Bok, the senior editor of the publishing company. In June 1998, casino magnate Steve Wynn bought "Dream Garden" with the intent of moving it to Las Vegas. The possibility of losing the significant mural led artists, historians and activists in the city to rally against the sale, and the Pew Charitable Trusts provided $3.5 million to PAFA to keep the artwork in Philadelphia. A requirement of that purchase, however, is that the mural stays at the Curtis Center, Guss said. "It's kind of a weird situation," she said. "The PAFA owns that mural but not the building. It's unique." Existing cracks can be seen on the mural, but those are pre-existing, said Guss, adding that L&I does not believe the recent construction has caused any new damage.